Here are some services you can avail of here in El Kabayo. 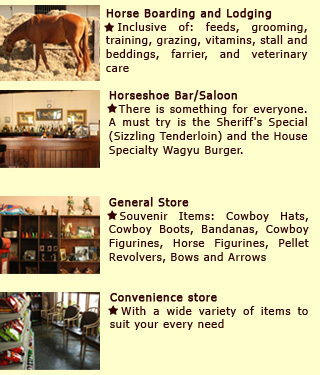 Browse through our horse activities, on-location availabilities, and amenities on the right side of the page. Riding a horse is an adventure everyone should experience. If you’re a horse lover but the expense of keeping a horse is just too much for you, here is your opportunity to ride to your hearts content while allowing someone else to take care of the horse. 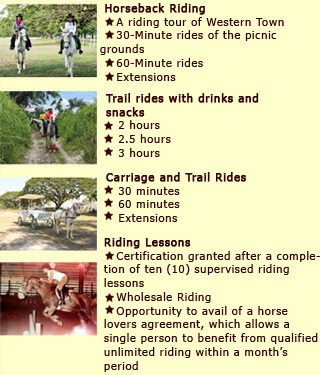 Ride your horse around the huge facility, or if you are an experienced horseman, venture into the surrounding greenbelt areas of Clark. If you’ve never been on a horse previously, you may want to avail yourself of lessons by a team of expert trainers and riders. Great BBQ food to boot! Besides all of the Western atmosphere and horse adventure, after a tough day of wrestling the cattle, avail yourself of the great American style old-west dining establishment.